I’m still trying to pinpoint exactly what it was that I wanted from Infinite Sky. It had the makings of a contemporary novel about family and love. In fact, I could go so far as to insist that this would be a novel that could potentially move me. What I got instead was a novel that felt plain, detached, dressed up with pretty turns of phrase. 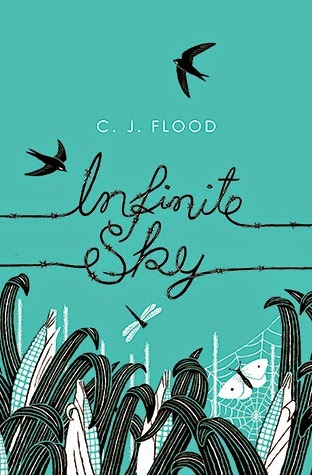 Flood focused heavily on two things in Infinite Sky – family and romance. While these two things are usually appealing to me, they just plain wound up not working here. Why? Because I felt so detached from all the characters, but particularly our main character Iris. I couldn’t really get into Iris’ head, nor could I understand how she was feeling and reacting. It was really tough for me to feel anything at all for her, which was to this novel’s detriment. But, you might ask, how about the story? Yes, sometimes, the story can be enough for my opinion of a novel to change. But Infinite Sky is a quiet tale, and with those, I feel like character connection is key to enjoying it. Since this was a no go from the start, I just wound up not really feeling this story. What, you might also ask, kept me reading till the end? There just so happened to be some beautiful turns of phrase, things that would hook me in, have me reeling from the truth in them. And these things would encourage me to continue on, even when I thought I might give up on this book. I was, unfortunately, underwhelmed by Infinite Sky. I could honestly see how this story might appeal to others, especially with the writing. However, my lack of connection to Iris really contributed to my negative feelings towards this one. Honestly, I wanted more – and I just didn’t get it. Hm, I think I'll pass on this one then. I've had a few stories with really pretty writing where I couldn't connect with the characters, and it damned them. Shame though, the cover is really pretty. Also, 'plain' is kind of a damning description. Thanks for the review!